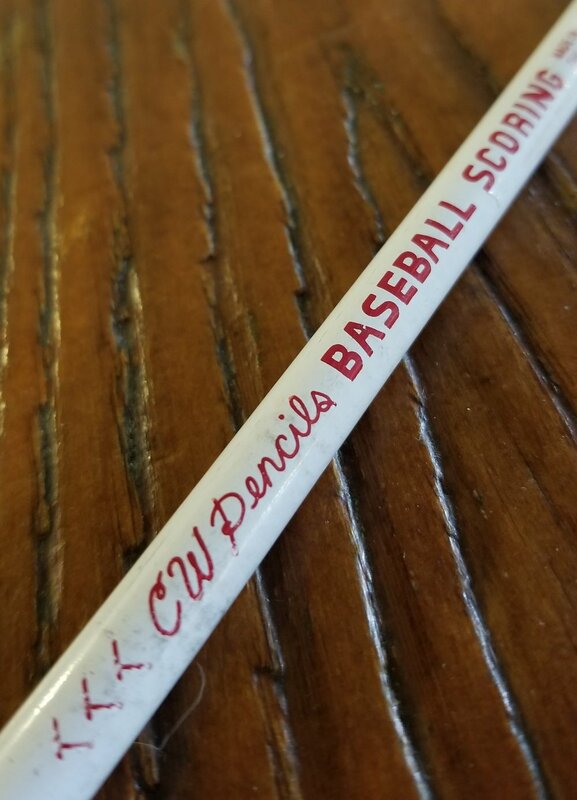 CW x General's Baseball Scoring Pencil — the weekly pencil. I love baseball. Growing up, my father’s love of the game was a focal point of my summer/early fall. He loved the Cincinnati Reds. We take a road trip most years to Ohio and would spend a few days in Pittsburgh to see the Pirates at Three Rivers Stadium for a few games and then onto see the Reds at Riverfront Stadium. Both of those stadiums are no longer there, but memories of my dad sitting next to me teaching me how to “keep the book” have lasted forever. When I was older, I used to keep the book when I would watch games on TV and would always delight when I could write that backwards “K” (a strikeout looking). Life has gotten busier and changed these past two decades, and I haven’t kept score of a baseball game in years. That’s why when I saw Caroline collaborate with General Pencil company to make a Baseball scoring pencil, I was hit with twinges of nostalgia and excitement. Everything about this collaboration is great— the packaging design is A++ and I really like how the lettering and color scheme take me back to the 50s when signs and lettering were hand done. The pencil itself is round-barreled and white with a gold ferrule and red lettering. What I really like about the design of the pencil is that there are three little v-shaped marks on each side of the lettering that make you instantly thing of the stitching on a baseball. They could have gone overboard with trying to make this pencil look like a baseball, but they didn’t and I like that the subtlety evokes the same sentiment without being over-designed. This pencil has a very smooth, dark graphite core. I’d say it falls in the B range. It is a bit too soft for me to comfortably write with as I have to sharpen frequently, but for keeping score the pencil is perfect. It works well on a variety of papers— toothy, smooth, standard printer paper, and notebook paper. I will say it really shines on toothier paper though. Marks make with this pencil erase well. I did have some trouble erasing all the marks I made while journaling in my Baron Fig Confidant, but I also press pretty hard, so that is an experience I have often. Next year, I plan on using these for score-keeping my good ol’ Cincinnati Reds, but I cannot bring myself to use these pencils in any other capacity. My heavy-handedness, dislike for round pencils, and impatience with having to sharpen every half page makes these a pass for me. These pencils are $2 a piece for $10 for half a dozen. I’d suggest ordering the six— you save two bucks and get the cool box.